Here in New England, it’s difficult to know how to dress for that timing between the middle of fall and the beginning of winter. Some days are warm enough that you don’t even feel like you need a coat, other days you may be caught in a freak snowstorm. 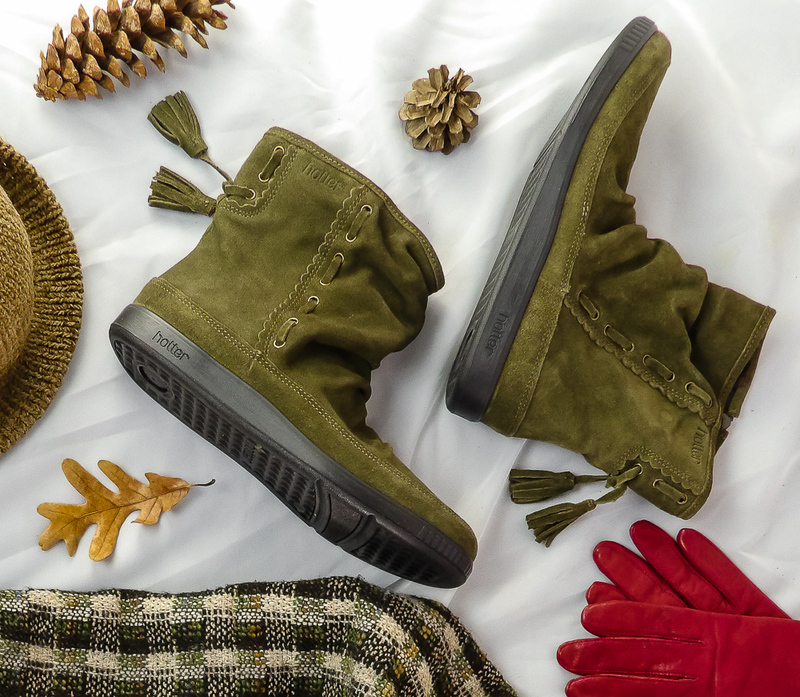 This calls for a stylish, versatile bootie that has the treads to cope with unexpected snow yet the style to meet a quintessential autumnal look. 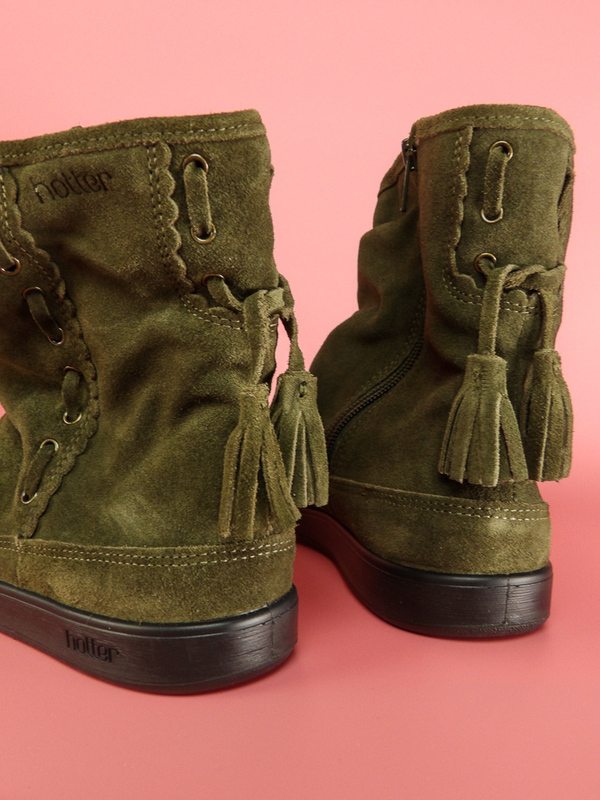 We love the style and comfort of Hotter Pixie Boot. 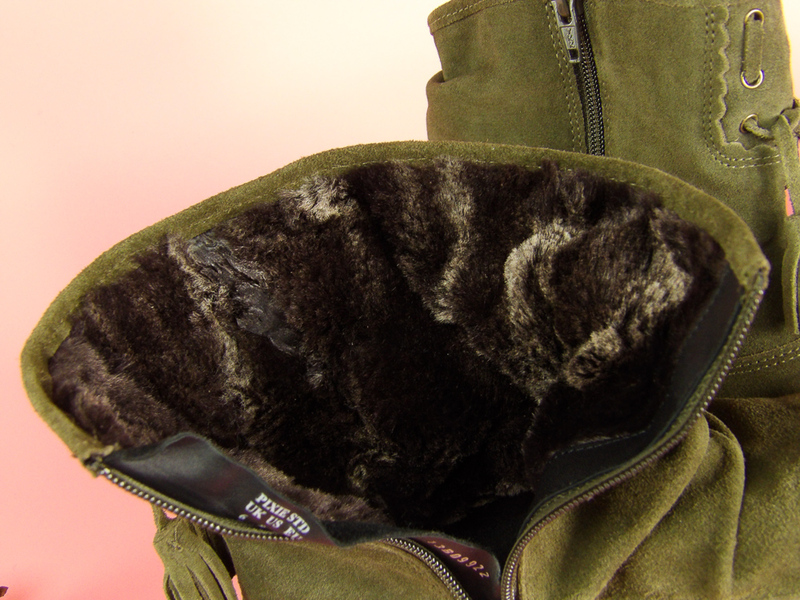 Pixie is a pretty Winter boot with an adjustable inside zipper and premium faux fur lining. 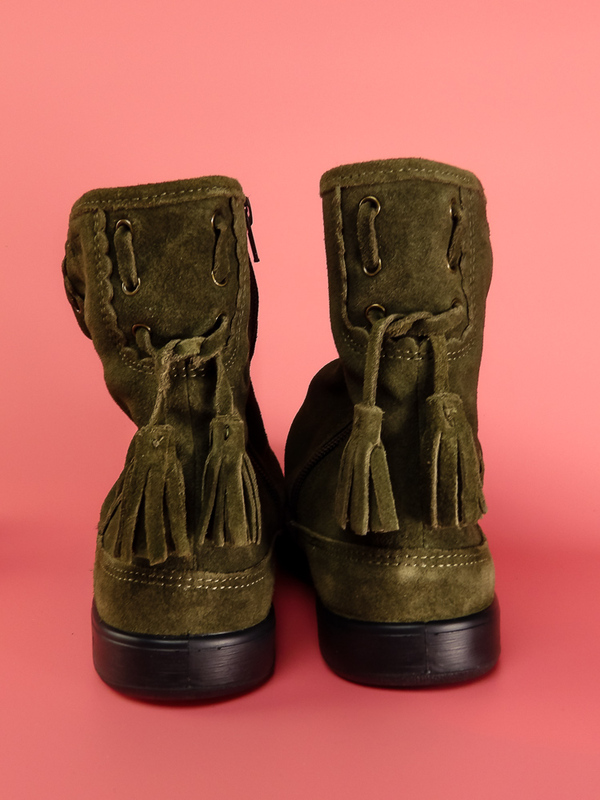 It has an on-trend slouchy soft suede design with a one-inch heel height. 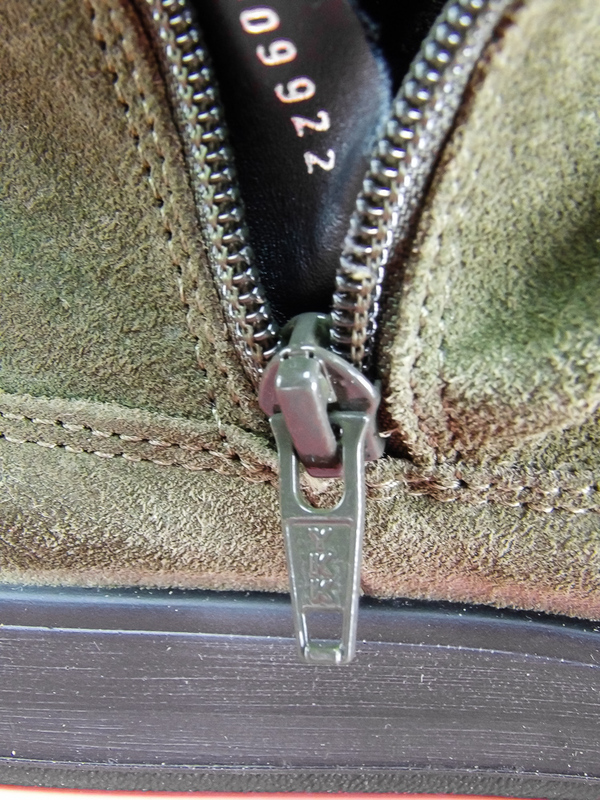 There is decorative detailing on the side and back. 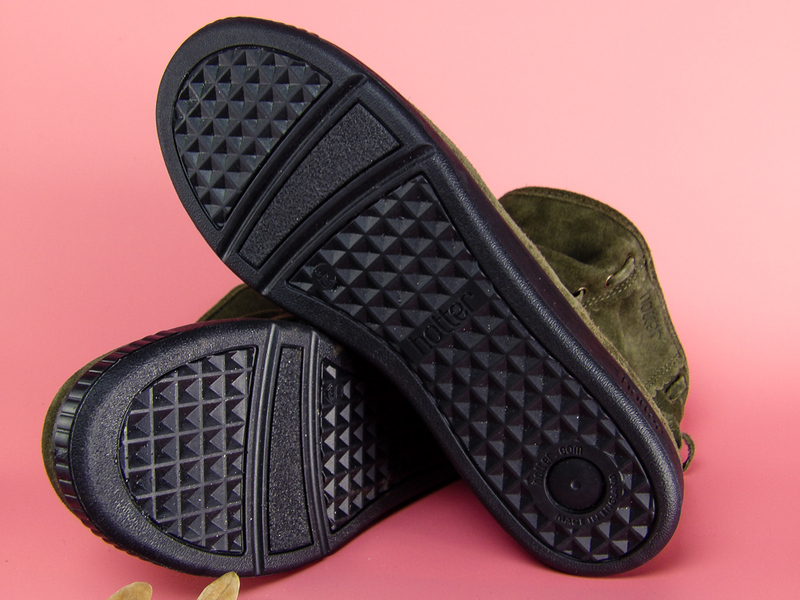 The soles are both flexible and lightweight, it is quite sturdy. They have a rounded toe for extra wiggle room or if you like to wear thick socks in the winter. 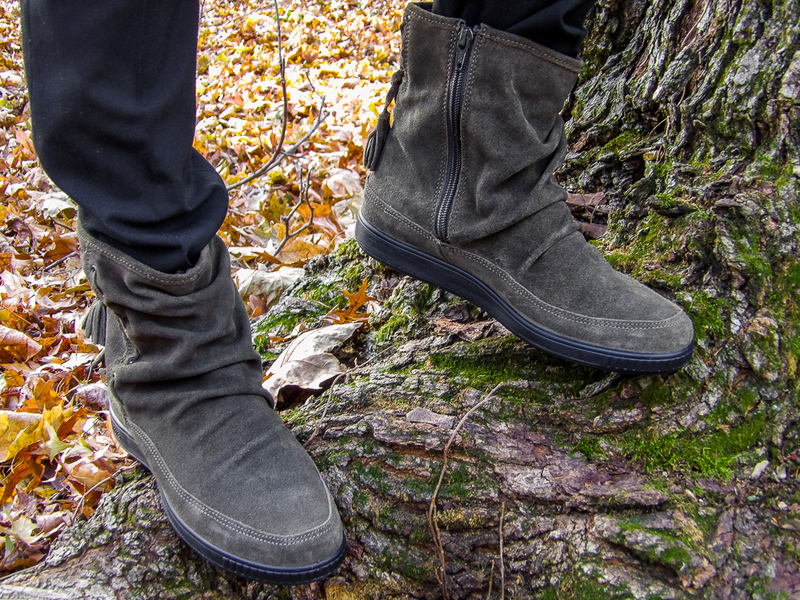 The sole treads are substantial enough to walk on wet leaves or slush without looking like a utilitarian style boots such as those worn for hiking or construction. Ideal for casual clothing including leggings, jeans or chinos. 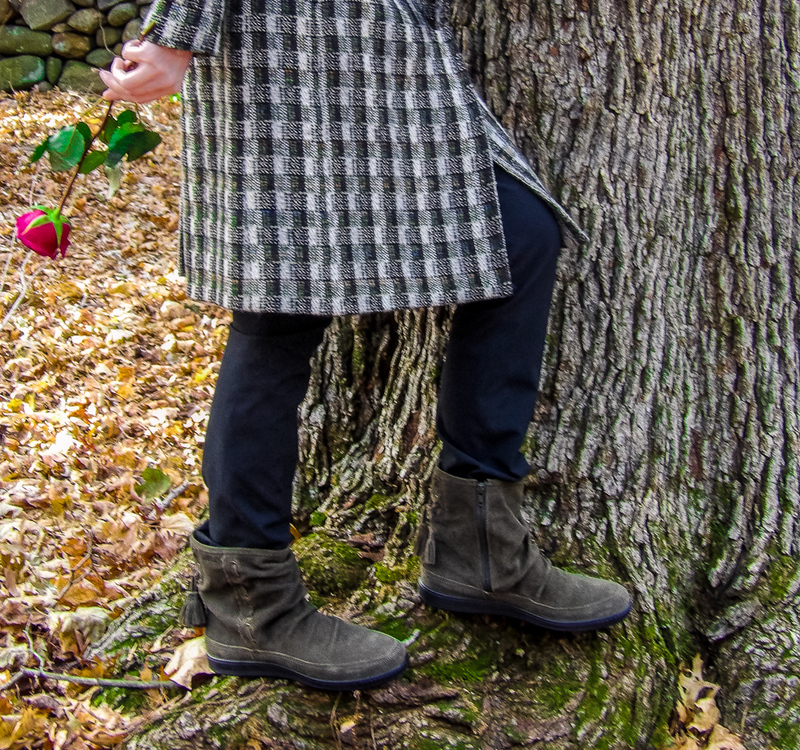 The Hotter Pixie boots come in Gunmetal, Navy, Plum, Rust and Loden Green. 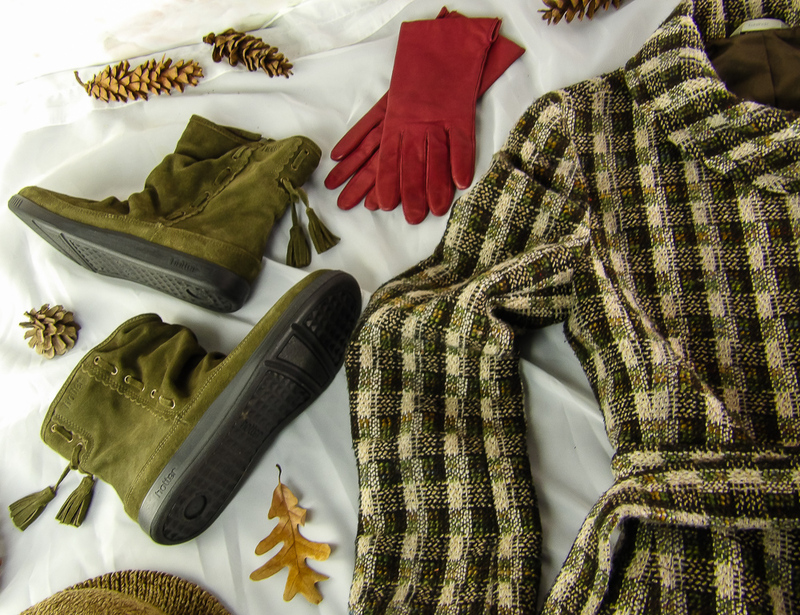 We selected the Loden Green, which is a subtle green that is very versatile with blacks, grays, and autumnal colors. I pair it with beige, maroon, russets, and oranges, but it also looks good with basic neutrals such as navy and black. I love how Hotter Pixie Boots look with my winter coat, hat and gloves. I find them useful for talking walks on uneven grounds such as parks and trails. They also are comfortable enough to wear when it the weather is unexpectedly a bit warm for the season, while still keeping me warm on chilly weather days. I really like the faux-fur lining and how comfortable it is. 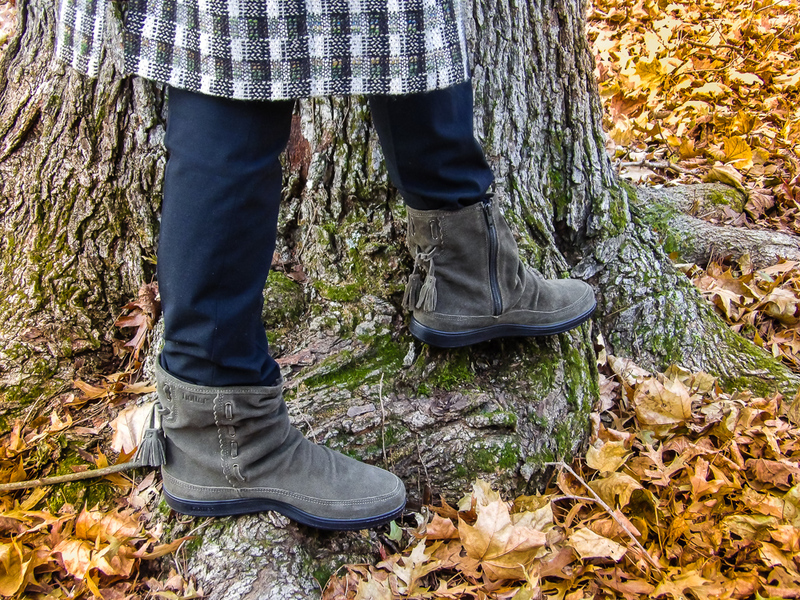 The soles have just the right amount of sturdy traction for walking on wet leaves or when the ground becomes slick from snow, as well as walking on uneven surfaces such as around trees. 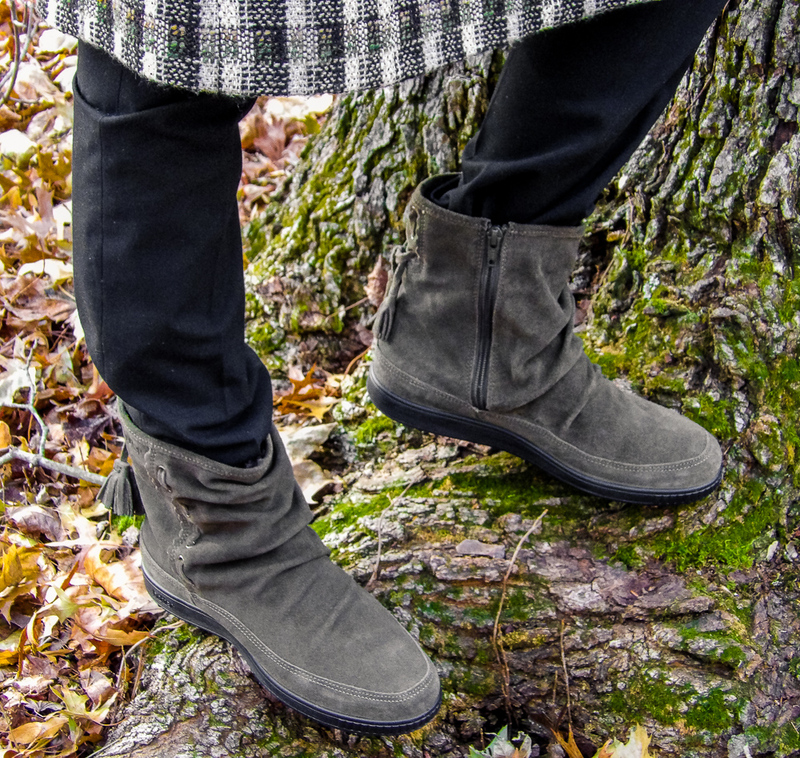 The soles are flexible, sturdy and not slippery, which is a problem I have found with slouch booties before is the soles wear and become slippery or uneven. The thick Polyurethane seems pretty solid. 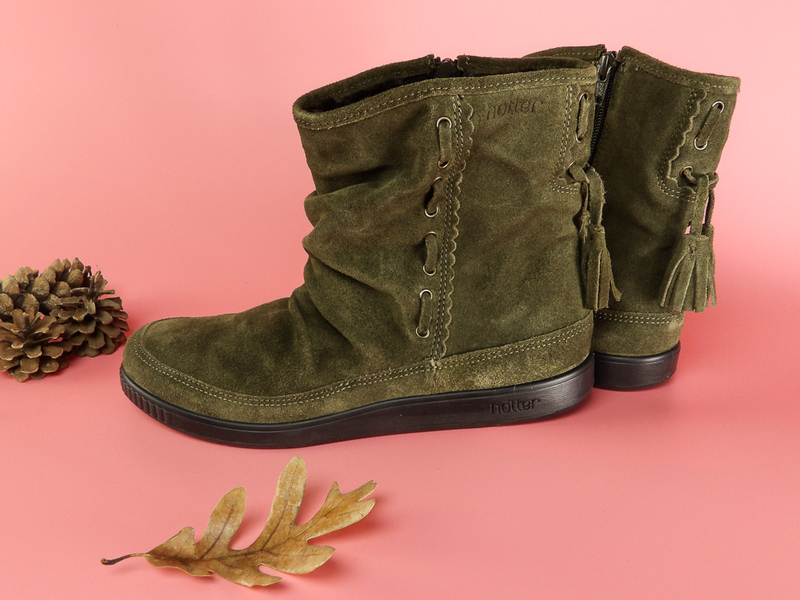 The Hotter Pixie Boots are a stylish update on the trendy slouch bootie look. 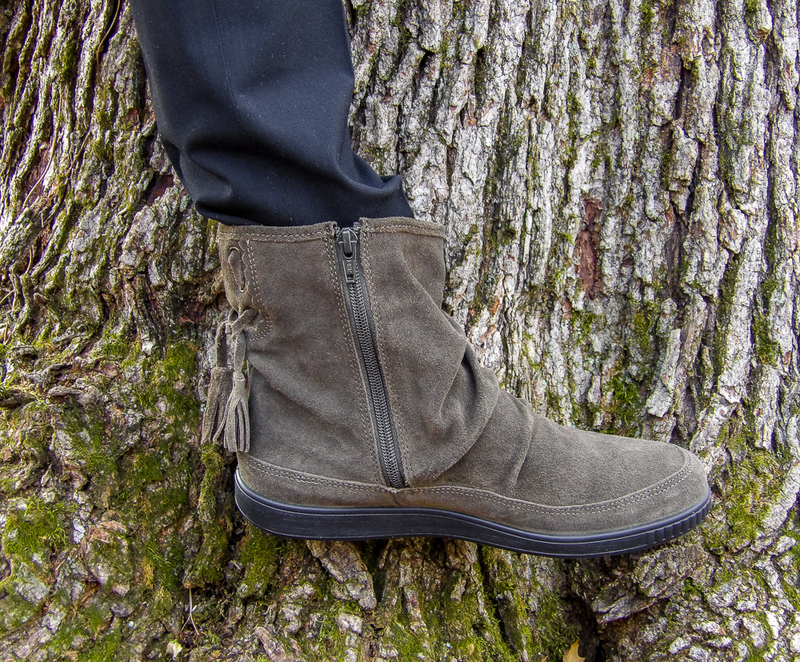 They combine versatile suede with several colors that compliment many colors in my wardrobe. 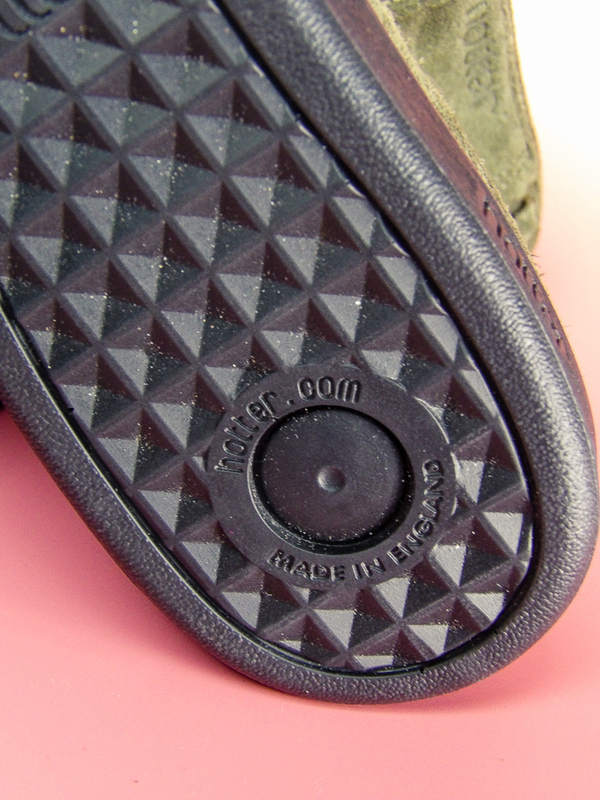 The materials are highly durable and they are extremely comfortable to wear with good support when standing or walking. 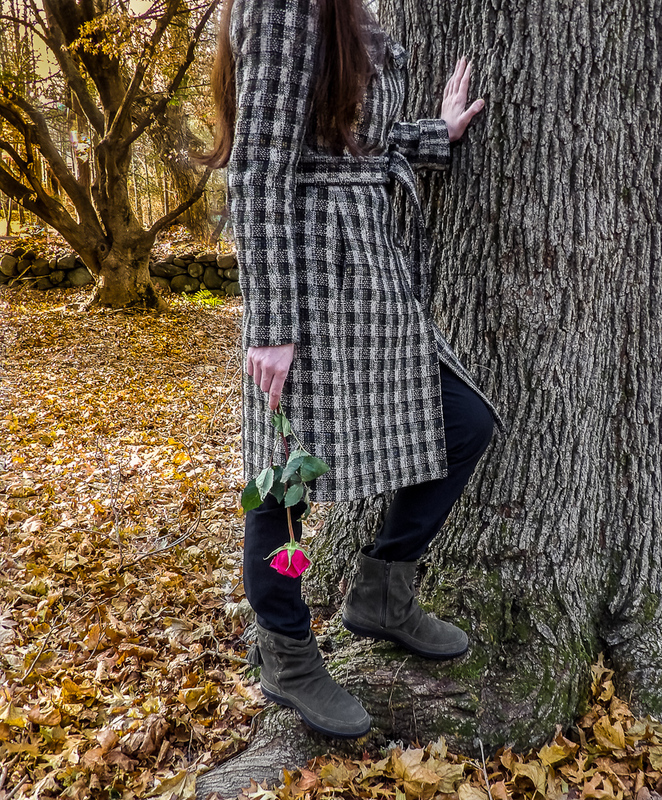 I find the heel height ideal for a day of shopping, traveling, at school, visiting a museum, the farmer’s market or other activities that require a fair amount of walking. 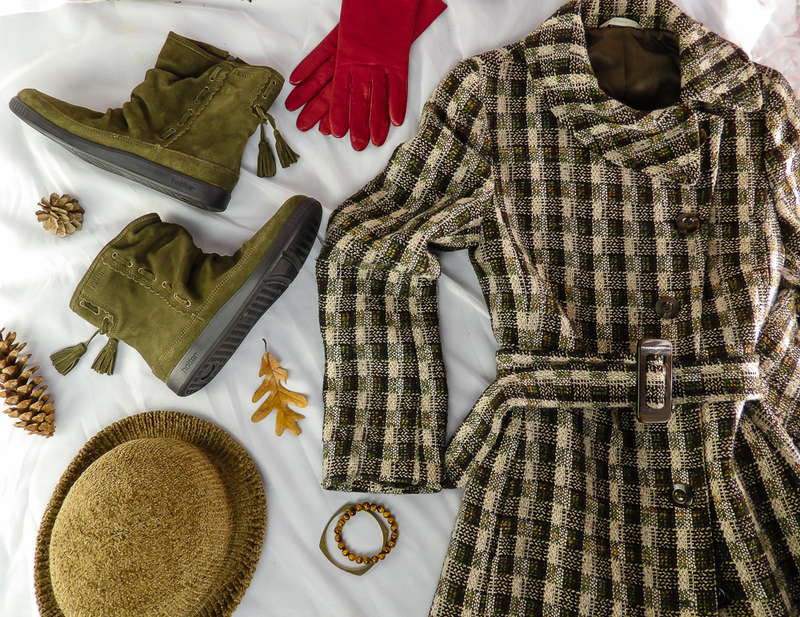 They also keep feet warm for outdoor fall activities such as stargazing, picnics, foliage trips, apple- picking, local fairs, tailgating and other autumnal and winter events. Style Chicks received the Hotter Pixie Boots in exchange for our unbiased review and received compensation for our time and effort. However, our experience with the product and the opinions expressed in this review are 100% ours. Posted by Style Chicks / Filed In: Fashion, Shoes!